Our Chakras 2 Milky Way Soap Mold consists of three out of the set of seven chakras. Important in several cultures, Chakras are spinning centers of energy from the universe that govern emotional, physical, and intellectual well-being. Draw energy with the lower three chakras of Solar Plexus (confidence), Sacral (new experiences), and Root (foundation). 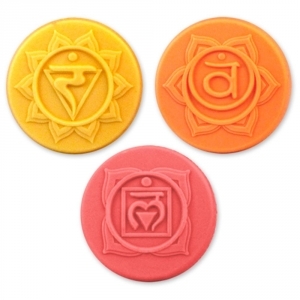 Soap Bar Dimensions: 1" x 2.75"
Notify me when Chakras 2 Soap Mold is in stock.